So now it’s over and I feel as if I’ve been hit by a stun gun. Been invited for cocktails–everyone’s to bring an appie–and don’t have the energy to get in the car to even buy a hunk of cheese. I do, however, have the energy to be with friends; I’ve been in the isolation tank too long. And have a drink. Not necessarily in that order. Rummaging through the back crevices of the fridge and thar’ she blows! One-half of a jar of roasted red peppers saddled up to some feta are speaking to me. Five minutes later I actually have something pretty tasty. I know there are plethoras of ready made dips to be found at local markets, but nothing–honestly guys–ever tastes as good as homemade. Even if homemade was made using short-cuts. 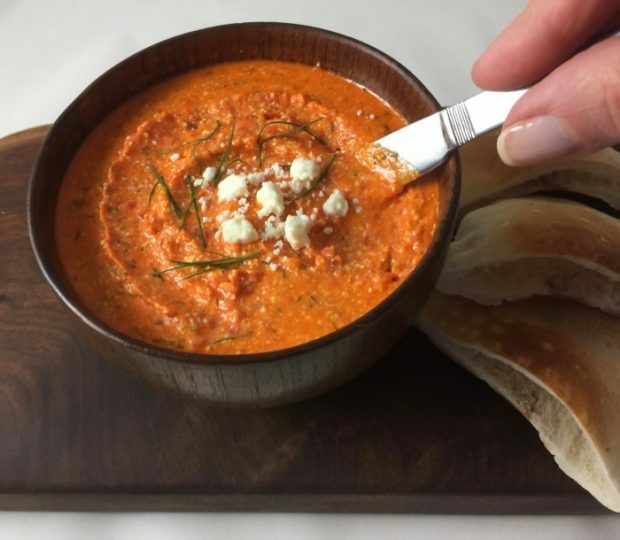 If you’re lucky enough to have a Trader Joe’s in your town, there are a few short-cut products I’ve found indispensable for making last minute appetizers. ♥ Their olive tapenade (the one found in the refrigerated section). 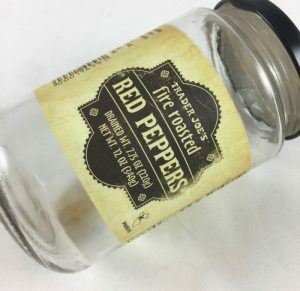 ♥ Bottled roasted red peppers (a shelved product pictured above) for a variety of uses. They’re as close to roasting at home as I’ve tasted. ♥ Their spinach-feta phyllo triangles (found in the frozen section of the store) ♥ Assorted cheeses (you can’t beat those prices). 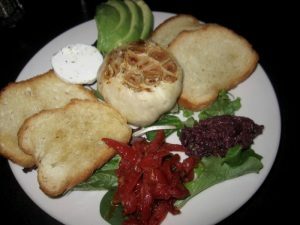 To make the platter above, I purchased the tapenade, goat cheese and roasted red peppers. Then, I roasted a head of garlic by: cutting off garlic head, drizzling exposed cloves with EVO, and then roasting in a double thickness of foil until cloves are softened, about 40 minutes. Sliced avocado and a crunchy baguette yields a tidy little Mediterranean nosh in no-time. Even quicker: Purchase a log of goat cheese along with the aforementioned tapenade, spread the tapenade over the goat cheese and serve with a baguette. A sprig of fresh rosemary placed atop the cheese is the perfect grace note. 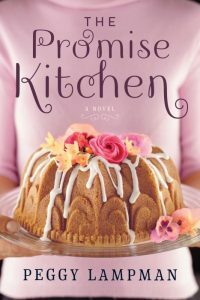 By the way, “The Promise Kitchen” is on promotion–only $2.00! The reduced price has meant the book sales have been darting about in the top 100 Kindle books in women’s fiction this month; last week the book topped 900 in overall library sales. (Not sure of the amount of women’s fiction but there’s well over a million books in the Kindle library.) This two-buck-book-chuck may be cheating, but I’ll take it. Place red pepper(s), feta, garlic, a pinch of cayenne, olive oil and dill (if using) in processor. Blend until combined. Refrigerate for several hours until firm. Serve with pita bread, pita chips or fresh vegetables for dipping. * I used the Trader Joe’s brand of bottled fire roasted red peppers. If you don’t have time to roast your own, these are the best I’ve found. They also are delish in this recipe for Pimento Cheese. I even add a teaspoon of the delectiable juice. Number of servings (yield): Enough to fill a small (2 cup) bowl. The perfect size for bringing to a potluck. Would love to see an advance digital copy!! You got it! It should be at summer’s end but I’ll make a note! Absolutely! I’m making a note! Mama Bear! Can you send your email to me?! BTW, I loved your first book. Will Shelby and Mallory be in “The Welcome Home Diner”? Sadly, the main editor thought that should be a stand alone book. This has all new characters–Addie, Sam, Braydon and Sun Beam–who I think you will enjoy! Me again, Mama Bear. FYI: although the story is set in Detroit, there is a lot of deep South influence from the great migration in the fifties to the Detroit factories in the fifties. The diner serves a lot of soul food and there are recipes such in the back of the book. Look forward to your thoughts. Please IM me on Facebook or peggylampman@me.com. It’s up on NetGalley! Hey, Peggy – I was just in N. Carolina thinking about you as I ordered chow-chow, collard greens, pork rinds, fried chicken livers and mountain trout. Do you have a good collard green recipe that omits the bacon fat? That’s a yummy green!! But stiff – should read “collared.” And something for those chicken livers – fried is so much better than toothless chicken liver pate… and yet fried is fried. Looking forward to the Detroit diner read.